In 1932, aged 13 and living in Church St in Long Bennington, Clifford Vincent Holmes saved local 7 year old Denis Hall from drowning in the River Witham. This became national news when he was presented with silver watch from the Carnegie Fund Trust. During World War 2 when he was serving in the Royal Navy his parents, George Edward and Kate Holmes, were living in Claypole. 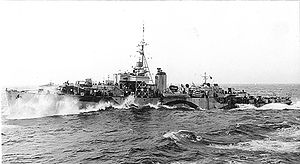 Clifford was serving as an Engine Room Artificer 3rd Class on HMS Itchen on 23rd September 1943 when it was torpedoed by a U boat in the North Atlantic and exploded. Only two of those onboard survived. Holmes is assumed to have gone down with the ship and he is commemorated on Plymouth Naval Memorial.